For a long time I’ve been interested in Adobe’s Kuler, dedicated to the art and science of choosing aesthetically pleasing color combinations. Or unpleasing color combinations, if that’s your thing. 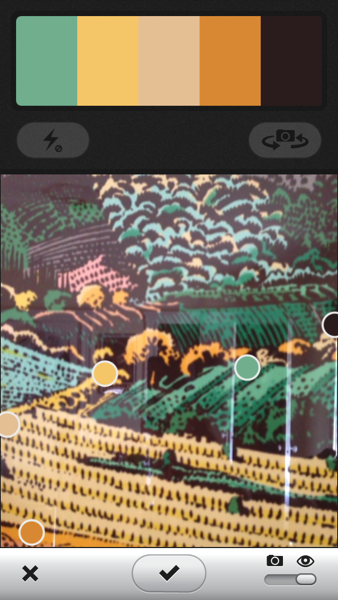 Today, Adobe released an iOS app for capturing and tinkering with color palettes. The palettes can then be automatically saved for retrieval through the Kuler web site, or shared via email or Twitter. If you don’t like the colors Kuler latches on to, you can move the camera slightly to provoke it to rejigger its choices. 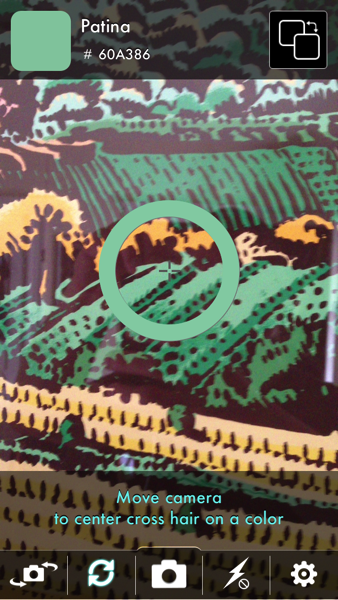 Or, tap the screen to freeze the camera, then move the sample points on the image to precisely the color of interest. Another tool I’ve used in the past is Color Identifier, which has a more streamlined utility for capturing solitary colors while further attempting to give a name and HTML-style hex color string to the captured value. I love this class of iOS app because it follows through on the promise of using a combination of technologies to grant superpowers to users. A camera or a computer by itself is of limited value for quickly cataloging something as precise as a set of colors from the environment, but a camera and computer united by clever software, all in the palm of your hand, is an exciting tool indeed. This is Daniel Jalkut’s personal technology soapbox. I make MarsEdit and other apps for my company: Red Sweater. On Core Intuition, Daniel and Manton Reece chat informally about Mac and iOS development. The Bitsplitting Podcast picks up where most tech interview shows stop. Indie Stack is my Cocoa development blog. Copyright © 2018 Daniel Jalkut. Buy my software.